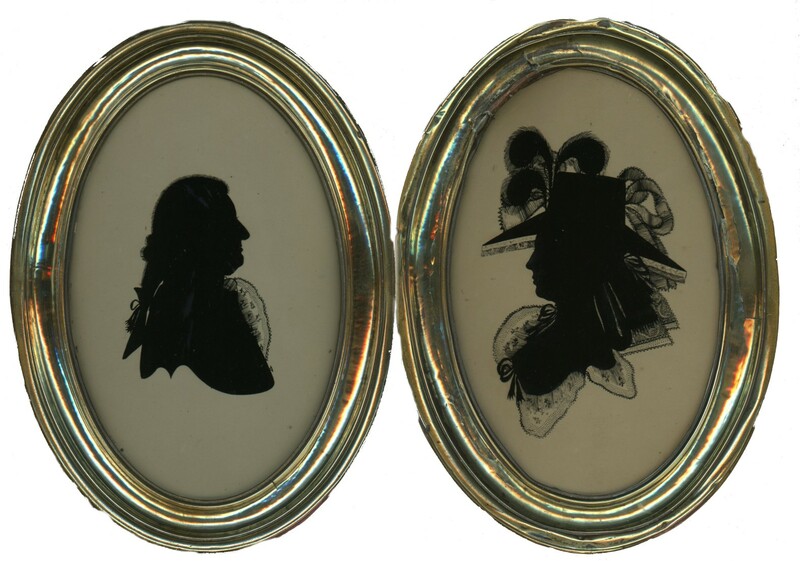 This is a rare opportunity to acquire a fabulous and well-documented pair of silhouettes painted on glass by Walter Jorden. The unnamed gentleman is shown wearing a bag wig where the end of the queue is enclosed in a cloth bag and tied at the nape of the neck with a bow. His coat appears to be collarless and his shirt is finely frilled and sprigged with flowers. 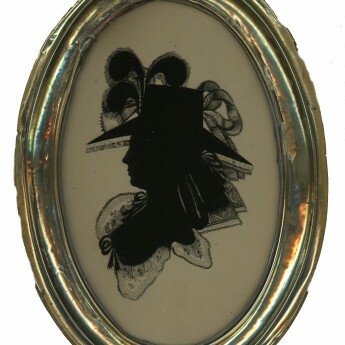 The lady’s dress is stylishly trimmed with fine lace as is her large hat that is adorned with plumes and ribbons with lace curtains around the brim and a narrow ribbon bow under her chin. Her hair is in a fashionable banging chignon with a thick loop of hair. 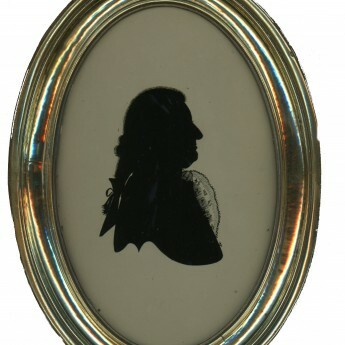 Jorden painted two sizes of silhouettes, these being of the larger size reverse painted on flat glass with the artist’s distinctive double-loop bustline. They were most likely backed originally with a second piece of glass coated in gesso but this has long since been replaced by card. When sold in 1988 they were described in the suction catalogue as being “against card background”. 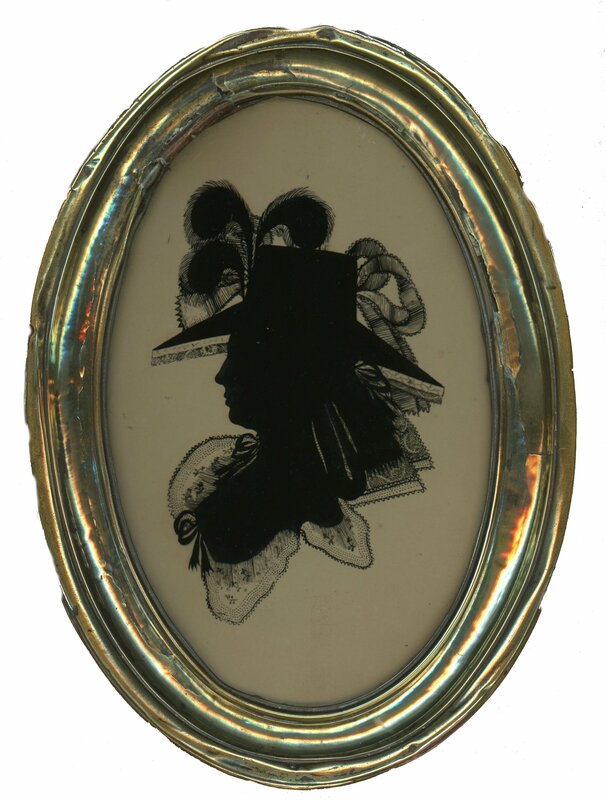 The paintings are in fine condition, the only minor paint loss being to a small area of a hat ribbon. The profiles are housed in the original hammered brass frames though one has suffered some damage, again of long-standing; it is still stable and secure enough to hang. 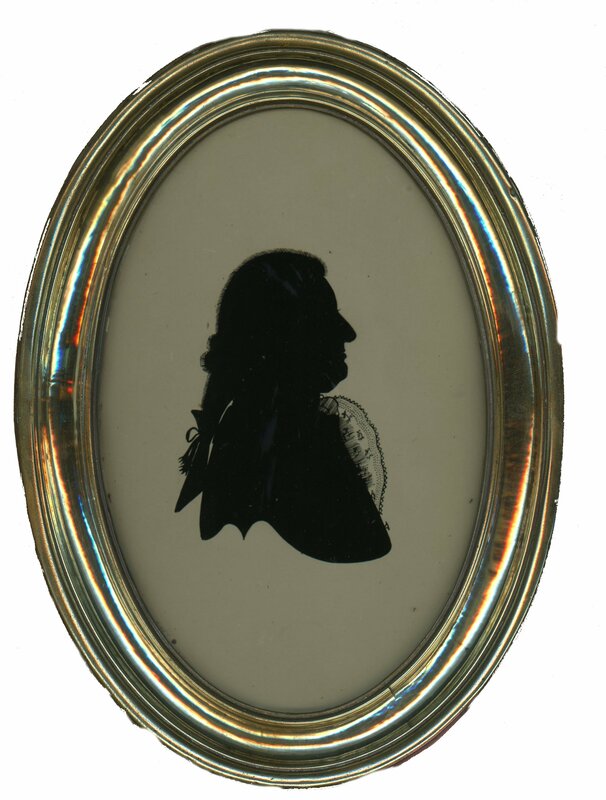 Little is known about the life and career of Walter Jorden (active 1776-1786) and his brother Richard who worked in and around the Welsh borders.